Inspired by Alastair Humphreys idea about Micro Adventures, I suddenly thought if we can have adventures on our doorsteps, so can our children, and Mini Adventures was born! With guidance from adults and a little imagination these adventures should not only give them great life skills, but also be loads of fun!! Our garden is fairly overgrown as we have only recently moved in, so my first idea was to utilise this as a wilderness setting, and using a big pile of wood I had been collecting up, we would have an open fire and cook marshmallows over it. Of course the marshmallows were to keep my two year old son Kaelan entertained, although myself and wife are also partial to one or two! 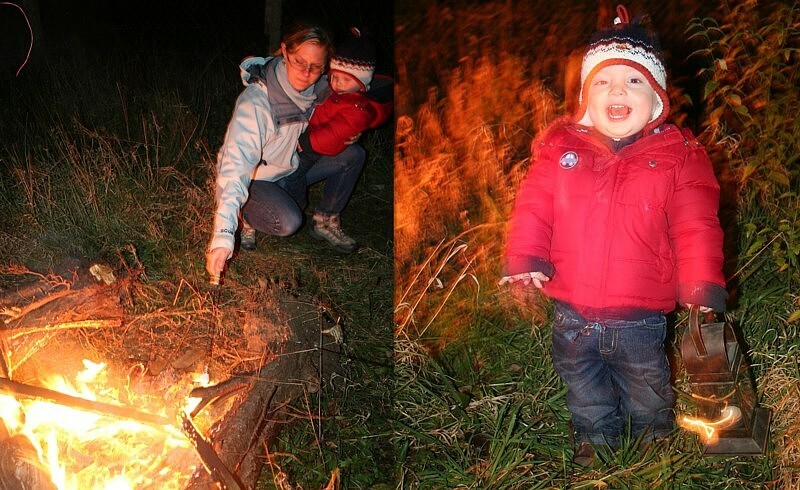 Fire is obviously dangerous, especially with younger children so this mini adventure needs two adults, one to light the fire and look after it and one to hold the mini adventurer. Take a big bucket of water with you too, to damp down any potential problems or accidents. Fire is dangerous, but with supervision from adults can also be a lot of fun. We were out to have an adventure so armed with a lantern with tea light inside, our little adventurer headed down through the long grass to the bottom of the garden in search of our small pre built fire. Sitting him down away from the fire, I lit it and there was soon a lovely orange glow lighting up his face and this was the point we explained to him that fire was dangerous and hot, and that he had to stand back and not to touch. Surprisingly he was so entranced by the odd orange spark shooting in to the sky that he was very well behaved! When the fire had burned down a little I moved two big logs either side of the fire to give some sort of protection from the heat, but with enough space to put a marshmallow over. We put a few marshmallows on a long fork and proceeded to help our little adventurer cook his first one. Once all gooey and blackened, we stood back and proceeded to eat them, I can’t explain how excited he was eating it, definitely a hit! We shared the whole packet between us and spent the remaining time cuddling in front of the fire and watching the fire crackle and spit sparks, our own little show! A very tired adventurer made his way back to the house, although showing a slight sugar high just before bed, but off to sleep and out for the count! It was a great little adventure for all the family and although tame for the adults, I hope we have planted a seed early for our son to go out and seek adventure.